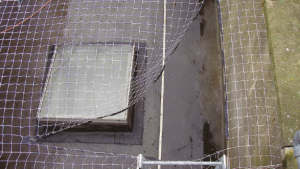 Usually we see black netting system being mis-specified and installed. 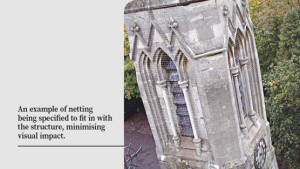 Other colours are available which may be more suitable for applications such as building façade nets, skyline nets and nets in front of windows or courtyards and lightwells. HDPE has a melting point of 130°C. When exposed to naked flame it will readily ignite and propagate fire rapidly across the netted area by dripping molten flaming plastic everywhere. It is best to use flame retardant netting system for indoor use or where there are people or combustible materials present beneath it. Therefore, careful planning and installation are essential to success. 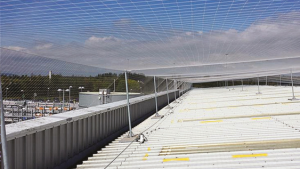 We will be able to provide you with detailed technical specifications for their netting systems which will give you essential information on the type and number of components needed. Each netting installation will vary from the next and will need a unique blend of components. Great care should be taken during the surveying and planning phase of any job to ensure success. If in doubt, ask us for technical support.